Recently, I've taken an interest in gaining code execution on my Surface RT tablet. I have found Windows RT to be rather enticing since Microsoft has made a concerted effort to prevent the execution of unsigned code. 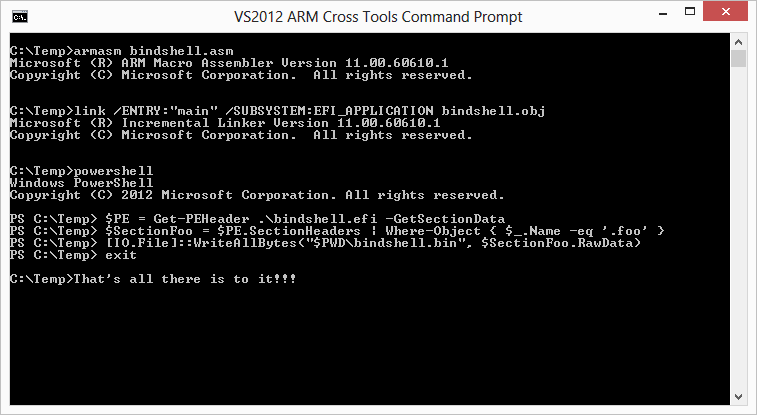 A couple weeks ago I discovered a way to gain arbitrary shellcode execution via PowerShell. I will have a separate blog post on that topic once I get a thumbs up from Microsoft. And for the record, I am aware of the awesome public Windows RT jailbreak. ;        at baseaddress + 1 since it is thumb code. cbz         r4,exit_failure ; If DllBase == 0, you've likely reached the end of the module list. Return 0.
cmp         r3,#0x61  ; Is the character lower case? cmp         r2,r5  ; Reached the last character in the module name? ; At this point, the module hash has been calculated. cmp         r3,#0  ; Are you at the end of the function string? bne         get_func_char ; If not, calculate hash for the next char. cmp         r3,r9  ; Does the calulated hash match the hash provided? cmp         r0,r7  ; Are there more functions to process? cmp         r4,#0  ; DllBase == 0? 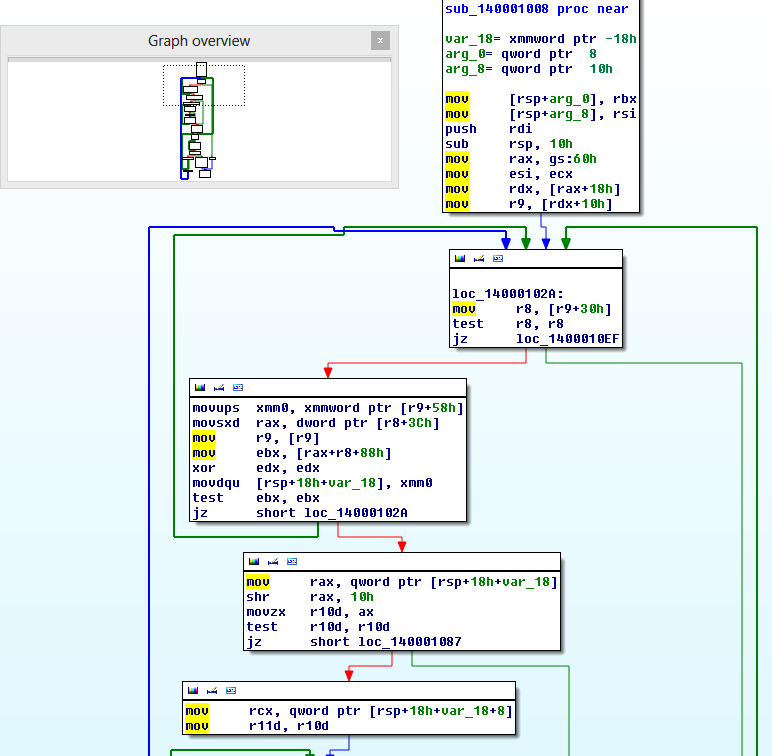 You may have noticed that this shellcode is written in MASM format, therefore, it can only be assembled using armasm.exe (the ARM equivalent of ml.exe). Unfortunately, armasm doesn't provide the option of outputting to a raw bin file. It will only emit an object (.obj) file. 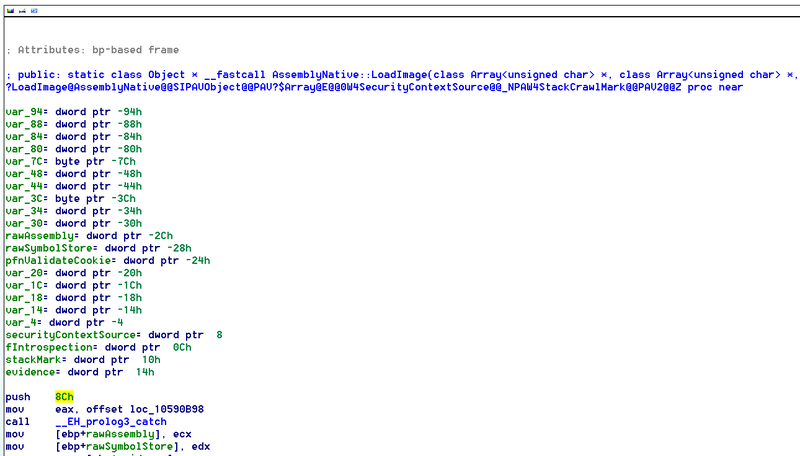 I wrote Get-ObjDump with the intent of pulling out raw payload bytes in mind but armasm doesn't apply relocations. This means that any calls to functions present in the payload won't be fixed up and it will crash upon executing. 1. link.exe requires that you specify an entry point. Solution: Obviously, I don't care about the C runtime library in my shellcode. The solution I came up with was to specify EFI_APPLICATION as the subsystem since it doesn't require the CRT. In the end, I don't care about the type of PE file I output. I just need the linker to fix up relocations for me. I can take care of pulling out the bytes from the .foo section of the resulting executable. 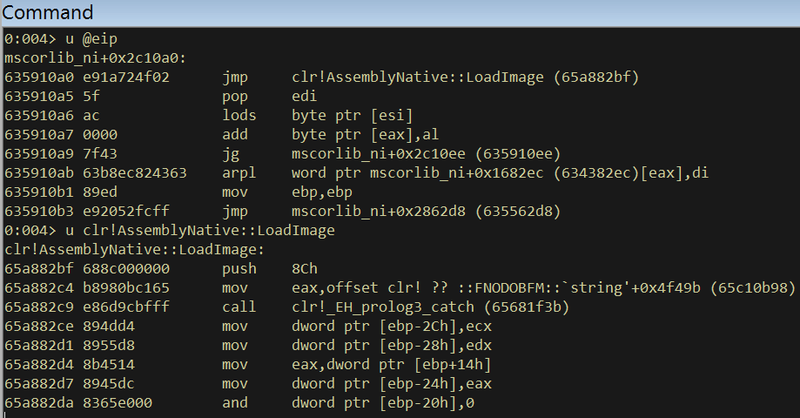 Fortunately, Get-PEHeader can rip raw bytes from a PE file. 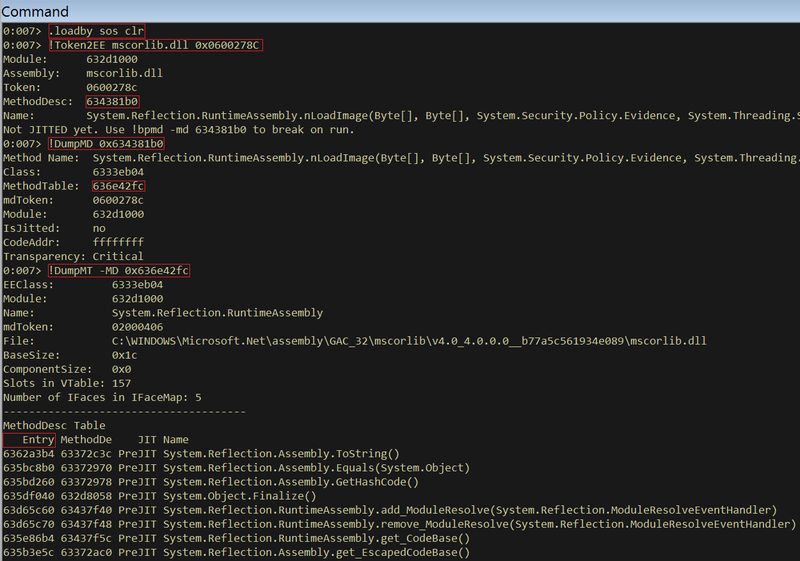 Those familiar with Windows internals are likely to have used the NtQuerySystemInformation function in ntdll. This function is extremely valuable for getting system information that would otherwise not be made available via the Win32 API. The MSDN documentation only documents a minimal subset of the structures returned by this powerful function, however. To date, one of the best references for the undocumented features of this function has been the “Windows NT/2000 Native API Reference.” Despite being published in 2000, many of the structures documented in this book are still relevant today. In recent history though, Microsoft has quietly expanded the number of functions returned by NtQuerySystemInformation. Thankfully, the vast majority of them have been made public via symbols present in uxtheme.dll (64-bit structures) and combase.dll (32-bit) structures in Windows 8. At last check, it appears as though Microsoft pulled these symbols from the latest versions of the respective dlls.